NongShim, the country’s largest instant noodle maker, was fined 155 million won ($143,022) for deceptive advertising of its latest product, Shin Ramyun Black, the corporate watchdog said Monday. The Fair Trade Commission called the company’s description of the item as an “ideal product meeting the nutrition ratio” misleading and ordered them to fix the advertisement. “Some food manufacturers, of late, have begun releasing ‘healthy’ products priced double or triple the level before. 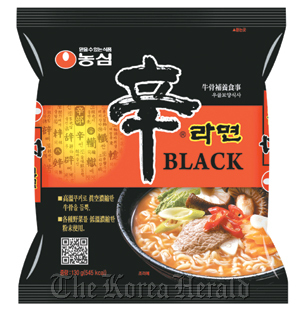 In the case of Shin Ramyun Black, the nutrition information written on the product was false,” the watchdog said in a statement. “Shin Ramyun Black is priced at 1,300 to 1,400 won per package and this is more than double that of Jin Ramyun of Ottogi, its competing product. But the two are similar in terms of calorie intake and nutrition level,” the FTC said. Shin Ramyun Black became the fifth-best selling instant noodle product in the country within a month of its release, generating more than 10 billion won in revenue in the first month alone. Never before had a newly launched product expanded its market share so quickly in the industry, a related source said. Some consumers expressed anger over the penalty, saying that the fine is too small considering NongShim’s violation.